Ciara Mageean is to split from coach Jerry Kiernan to move to the Manchester-based Team New Balance which is guided by Steve Vernon. Mageean joined Kiernan shortly after parting from her previous coach Eamonn Christie in March 2013 after an ankle injury had badly affected her in 2012. "Jerry took me on before my ankle surgery and helped me on my journey of recovery," said Mageean on Friday. "He gave me the confidence to know I'm as good as any athlete in the world." However, Mageean added that she is "confident Manchester is the right place for me at this point in my running career". "The change of environment and having a professional team around me day in day out is what I need to make the sort of progress that I want to, to be more consistent and to deliver the results I know I am capable of - especially when I pull on my Irish vest. "That is what is most important for me, running for Ireland and representing my country, my family, my friends and myself." 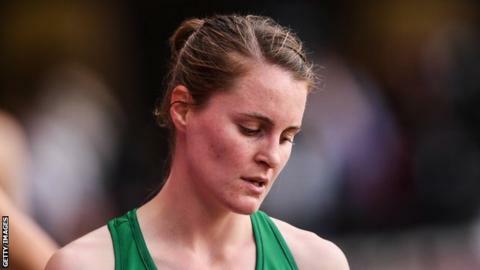 Kiernan helped nurse Mageean back to fitness as she missed the entire 2013 season before returning to action after nearly two years out when winning the 1500m at the 2014 Irish Championships. With Mageean's foot injury having to be carefully managed, she was unable to compete at either the European Indoors or the World Championships in 2015 but a new personal best meant that she secured qualification for the 2016 Olympics. Prior to travelling to Rio, Mageean made a major breakthrough by winning 1500m bronze at the European Championships in Amsterdam. Mageean ran an impressive opening heat at the Olympics a month later but struggled in her semi-final although her season ended on a high as she improved her personal best to a world-class 4:01.46 in Paris. After dropping out of 1500m final at this year European Indoor Championships, Mageean suffered another disappointment in August when she failed to progress from her World Championship heat in London. Her main target for 2018 are the Commonwealth Games in Australia and next summer's European Championships in Berlin.